Two big heads up for this recipe: You need a high-speed blender, and the cheesecake needs to be refrigerated for at least 8 hours, preferably overnight, before serving. 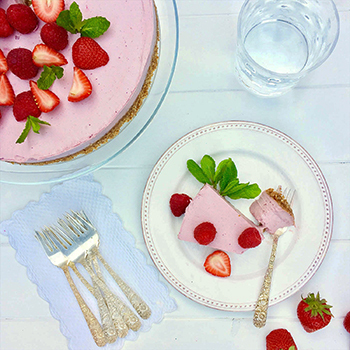 We have adapted this wholesome and delicious “cheeseless” cheesecake from Café Gratitude, a raw food restaurant that is well regarded for their innovative RAW desserts. What’s really exciting is that you can make so many different flavors using this method, from Key Lime and Banana Cream Pie, to Deep Chocolate. They are all fabulous! If berries are your thing, let this version be a little peek into the possibilities of RAW desserts. Lightly grease the cheesecake pan with coconut oil. Place the almonds, dates, vanilla, and sea salt in the bowl of the food processor fitted with the steel blade and process until the crust starts to rise on the sides of the bowl. Stop the machine and mix with a spatula or spoon. Repeat a few times until crust begins to form a ball. Be patient, as it may take a couple minutes, depending on the size of the dates and moisture in the almonds. Don’t fret if it does not come together in a ball. You just want the mixture to hold together when you pinch it. Distribute crust evenly on the bottom of the pan. Set aside. Pour about a third of the filling on top of the prepared crust to create a thin layer. Distribute 1 cup of the remaining berries on top of the filling, then add another third of filling, followed by 1 cup berries, then the remaining third of the filling. Place in the freezer to set, 1-2 hours, or in the refrigerator overnight, until the middle of the cheesecake is firm to touch. To serve, remove the spring-form ring by inserting a knife along the inside edge of the pan. Open spring-form, remove the ring, garnish with berries, and serve. Store covered in your refrigerator for 4-7 days. It freezes well too. Soak cashews in a medium bowl covered with water and a large pinch of sea salt. Let sit for 4-6 hours or overnight. Strain. Soaking the nuts eases digestion and enhances nutrient bioavailability. Homemade almond milk is always the best, but if you are short on time, feel free to use a store-bought almond milk. Coconut milk would work well too.